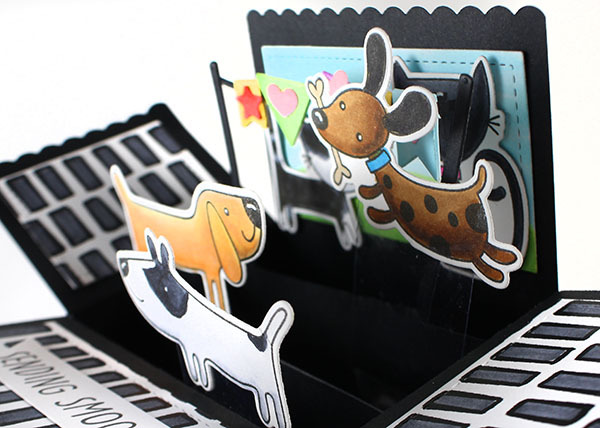 Today is my girl Vienna’s birthday – so today….it’s a pup card! And since I haven’t STILL made an explosion box (I bought this die a YEAR ago!! ), I figured…it’s time! Watch the video below or click HERE to see it in HD on YouTube. I decorated the box panels with the black and white patterned paper from Ellen Hutson – keeping the box all black and white (like Vienna!) except for the center “party” section. I love that these really DO fold super flat; I was skeptical, but….gotta say, it’s true! It’s a one-stamp card. Bible Journaling Challenge begins today! Hope some of you will join in! Lisa, one of the folks planning to join in, started a Facebook group so we can share our work – some folks prefer a more private setting. There’s also an all-students all-classes Facebook group for students – a great place to share your work from ANY of my classes! Seeing the Scriptures Class, coming March 1 2018!! Happy birthday to Vienna! That is just the cutest box. I love doggies. Happy Birthday Vienna! I love the Exploding Box and that you dedicated it to Vienna, love animal lovers! HAPPY BIRTHDAY TO VIENNA ! Your box is adorable. 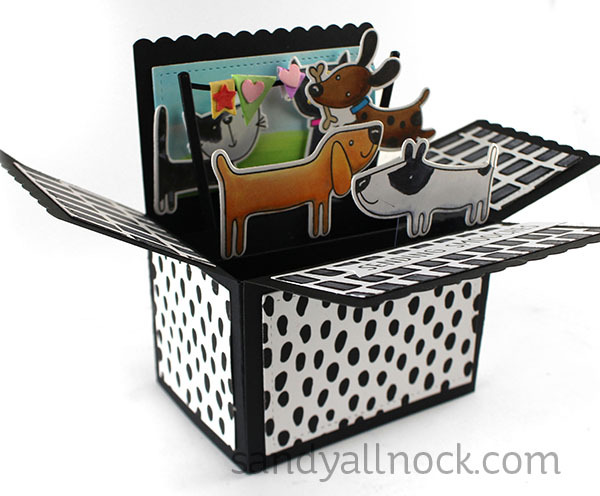 I love this box, it makes really great birthday’s cards for kids. Wow~ It was worth the wait (for your explosion entrance!). I, too, have one of these dies that needs to be dusted off and you have just given me the inspiration to finally do it. Darling card and happy bd to Vienna. What fun! Happy Birthday to your sweet pup! Happy Birthday Vienna!! Loved the box . Thanks for sharing. Oops almost forgot to wish you a Happy Valentine’s Day. 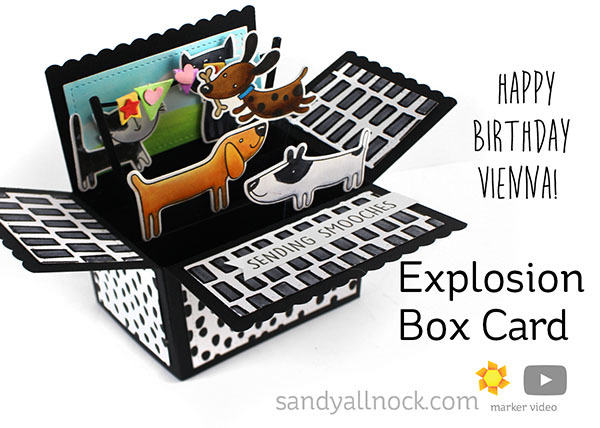 Such a cute box card, Sandy. I created one box card several years ago, but I had to measure out all of the pieces. Having a die do all the work for you would definitely make creating these fun surprises a lot easier. This is so cute. I have been “eyeing” that box die for some time now, its awesome. Happy Birthday to Vienna and Happy Valentine’s Day to YOU! I love these boxes. I’ve been making them since I got the did last year. They were an instant hit with customers and the people I sent them to. Your card is fabulous and I remember Ciera. I was sad when she passed and not long after our boy passed. Tell. V woof woof and give her a treat. Great card. I love all the animals. Happy birthday to Vienna. Wow – I hadn’t really noticed these before – what a fun surprise when someone opens their mail! And tell Vienna “Happy Birthday” from me, too!